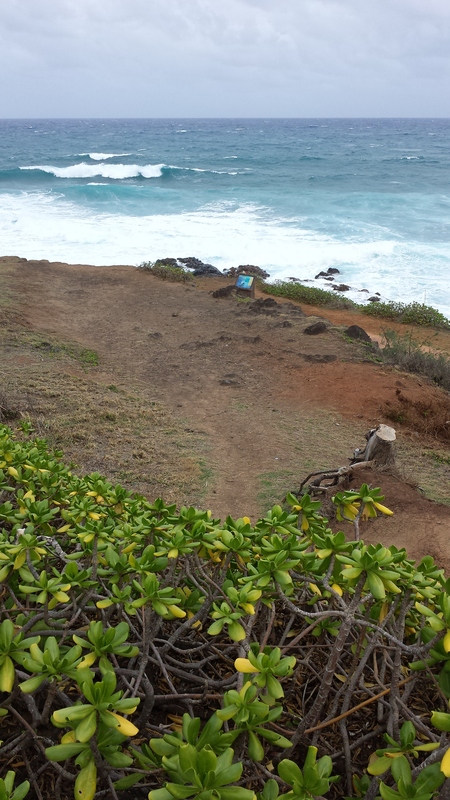 The view of Kipu Kai beach, the last stop on the ATV tour, did not disappoint! 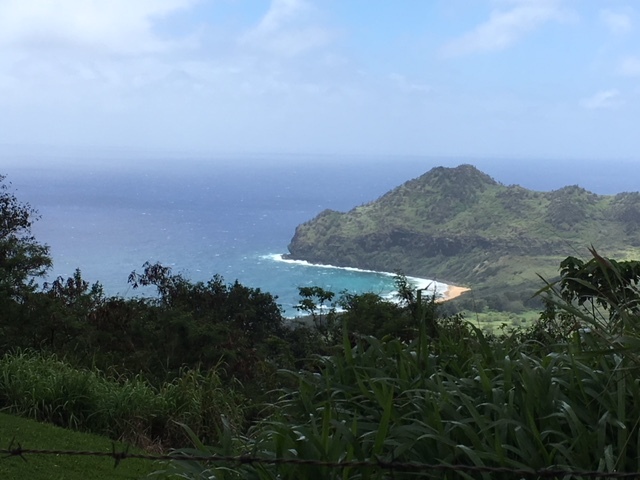 With just three months left to go before we set off on our Big Adventure, I figured this was a good time to check our Kaua’i bucket list and see how we’re doing. 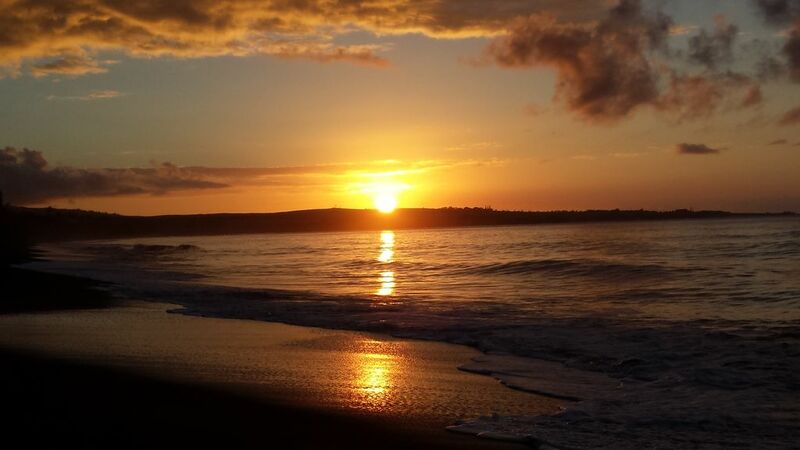 Rent a beach cottage for a couple of nights at the Pacific Missile Range Facility, to enjoy the beach and experience the gorgeous sunsets. We have reservations for a two-night stay in early July. We have a two-bedroom cottage, so YaYu is going to bring a friend along. Hike Waimea Canyon. Brett, YaYu and her friend will hike somewhere in the canyon while we’re staying at the PMRF cottages. 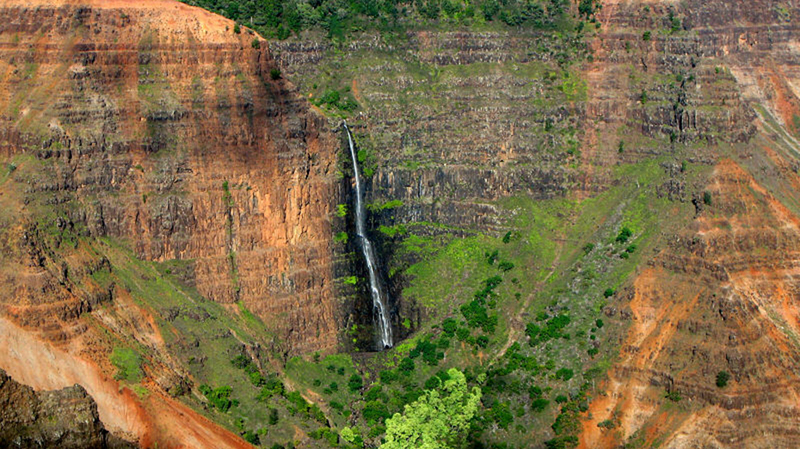 Brett, YaYu and her friend will have several trails to choose from for a hike in Waimea Canyon. Hike the Wai Koa Loop/Stone Dam trail. The trail and the dam were destroyed during the April flooding, and are currently still closed. I’m not sure whether I’ll be able to do this or not, but I’ve heard rumors the trail may be open again later this summer, but I doubt it will be as beautiful as it once was. Even if I don’t get to go, I’m grateful that Brett and the girls had the opportunity. Take an ATV tour out to Kipu Kai Ranch This was so much fun – Brett and I did it in April with our friend Denise, and it lived up to the hype. 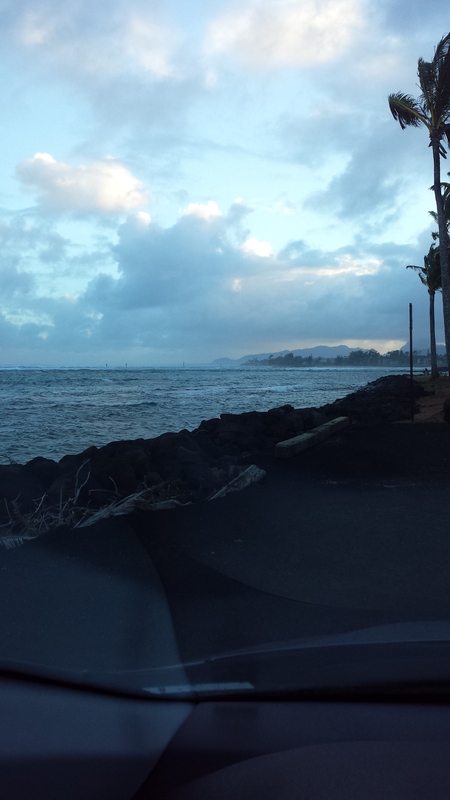 Get up early and hike out to watch the sunrise from the Pineapple Dump. We’re going to do this after we move over to the condo in late July. Take the tubing adventure tour. I did this with my grandson and daughter-in-law, and it was very fun and total worth going. I highly recommend! 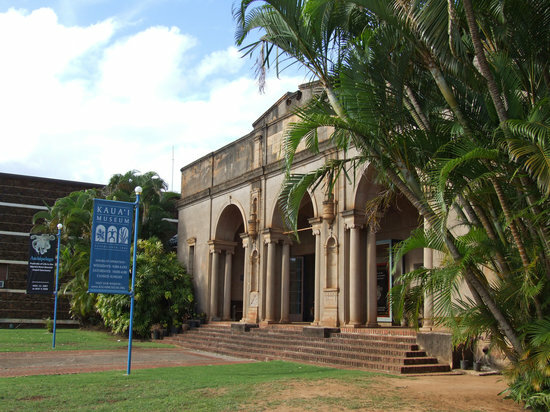 Visit the Kaua’i Museum in Lihue. Another activity we plan to do after we’re staying at the condo. 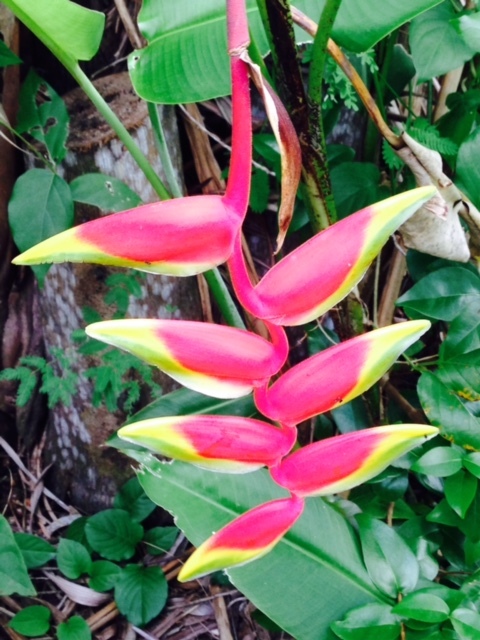 Tour the Limahuli Gardens & Preserve. 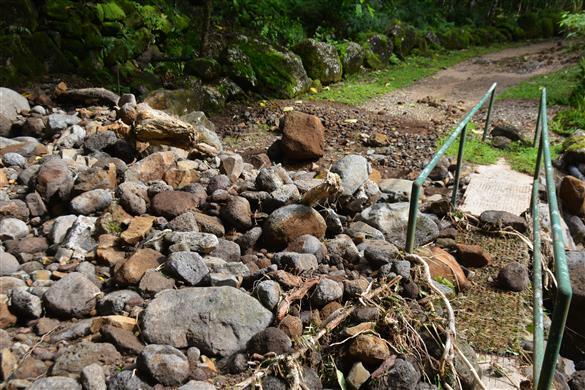 The garden, located on the north shore, was severely damaged during the April floods and remains closed. Actually, I don’t even think anyone can even get there any more because of damage to the roads. 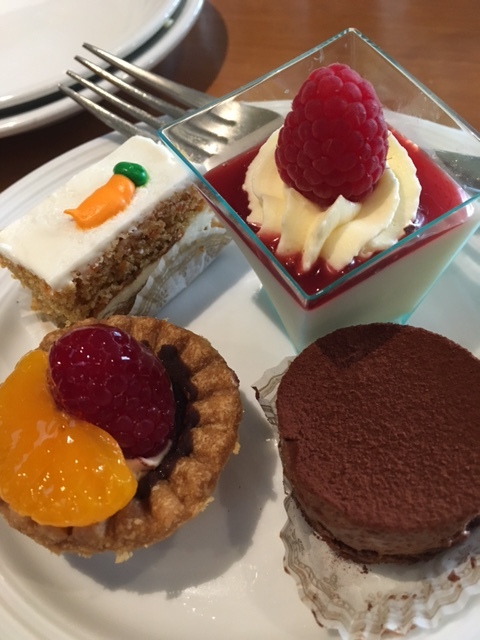 Celebrate our anniversary this year at Duke’s Kaua’i. Brett and I thoroughly enjoyed our dinner here: great food, a terrific view and a HUGE complementary slice of their famous Hula Pie! We were seated at the table on the left and enjoyed this same stunning view. Have a lunch date at Brenneke’s Beach Broiler. Another nice outing earlier this spring, and we enjoyed our lunch. Have dinner at The Eating House 1849. 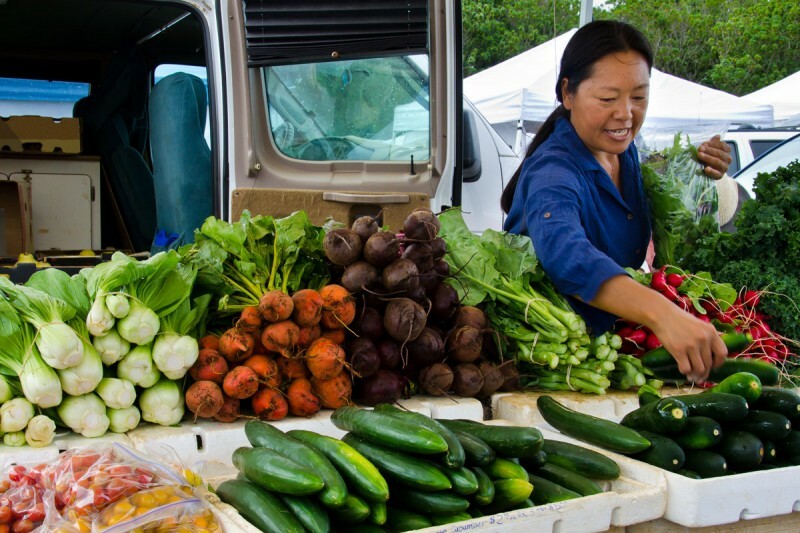 We are planning to take YaYu with us to eat here the night before we depart Kaua’i – we think it will be a great ending to our time on the island – and at Bar Acuda in Hanalei. We’re currently undecided about this. Not that it isn’t good, but will we have the time and $$$? 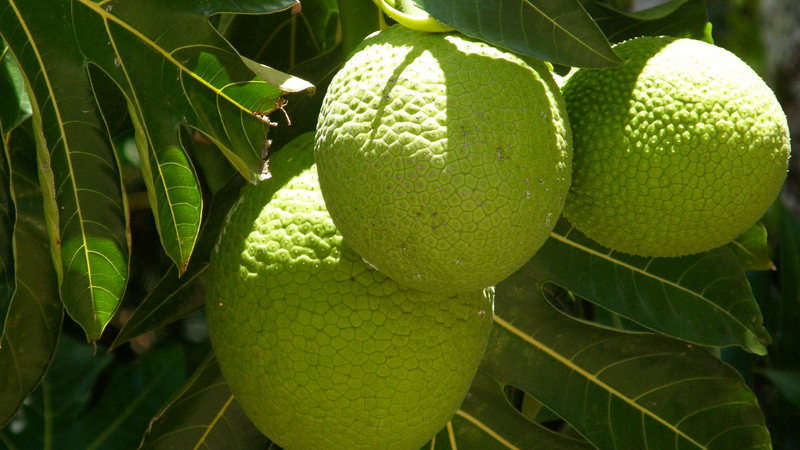 Try breadfruit. 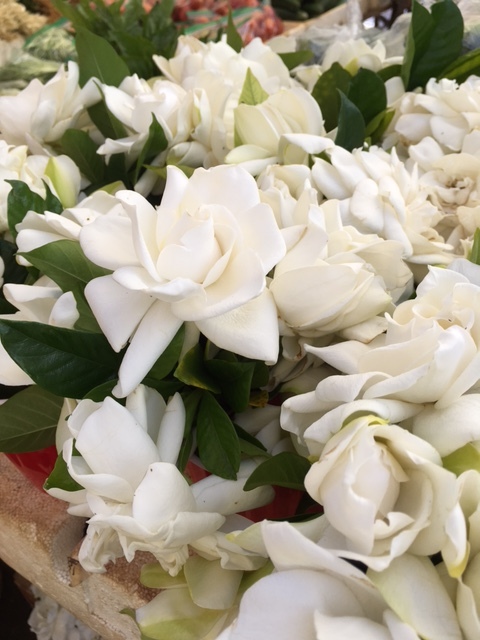 Glad we got to do this with WenYu – she loved breadfruit! We all thought it was delicious. WenYu ate hers with butter and syrup. 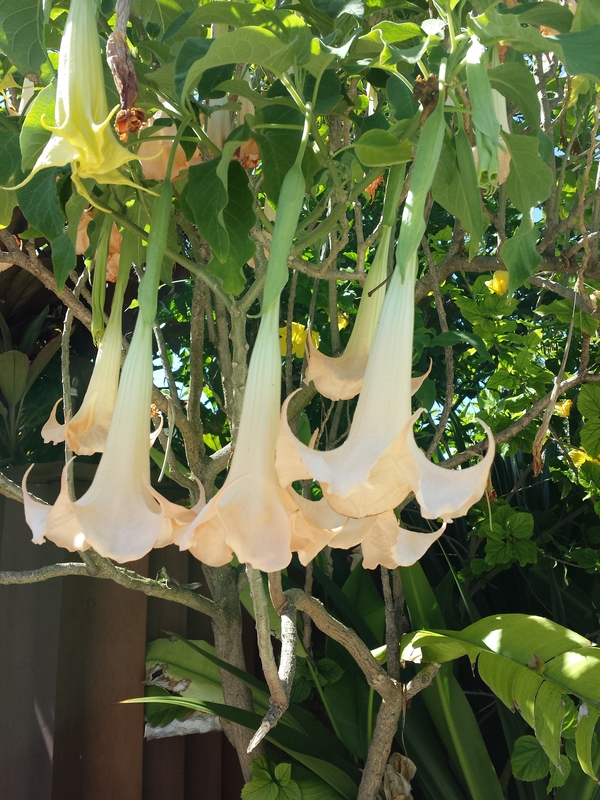 Make an overnight visit to the Big Island to visit Volcanoes National Park. 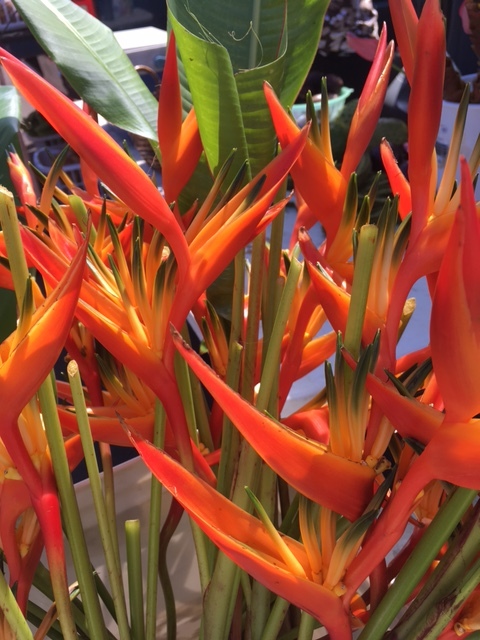 We have flight reservations over to the Big Island for late June, and a reservation at the Kilauea Military Camp, but the camp is closed indefinitely due to volcanic eruptions, and the whole trip could end up being cancelled depending on what’s going on with the volcano at the time of our trip. 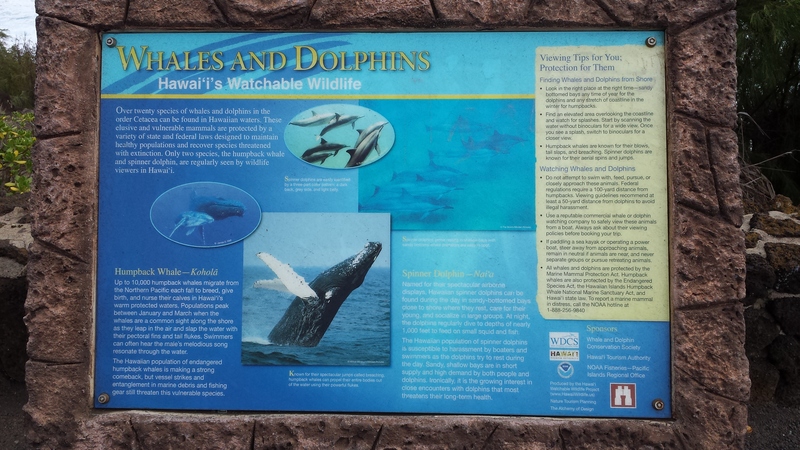 If we go but can’t visit the park, we’ll drive from Hilo up the east side of the island and around the top and down to Kailua-Kona for the night, making stops along the way, and then go back the same way the next day. 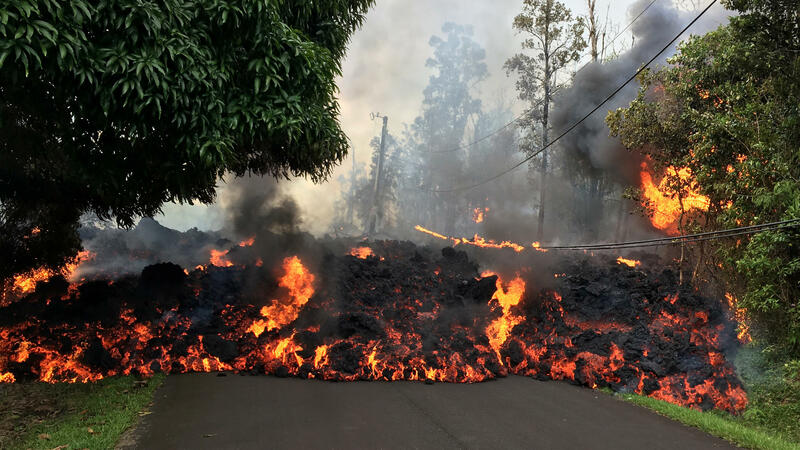 This doesn’t make me eager to visit the Big Island. Out of fourteen items on our list, we’ve accomplished five of them, have reservations and/or dates for six, one has had to be cancelled because of the floods, one is an unknown, and we’re undecided about one. Not bad! Fresh malasada – what’s not to love? I avoid most carbs and can say no to a doughnuts, but I will not say no to a malasada. First of all, they are delicious. Second, we don’t see them very often because they sell out very quickly here. Traditional egg-shaped and sugar-coated malasada may look like a regular doughnut on the outside, but their appearance hides the deliciousness inside. They’re way more rich and flavorful than a regular doughnut. 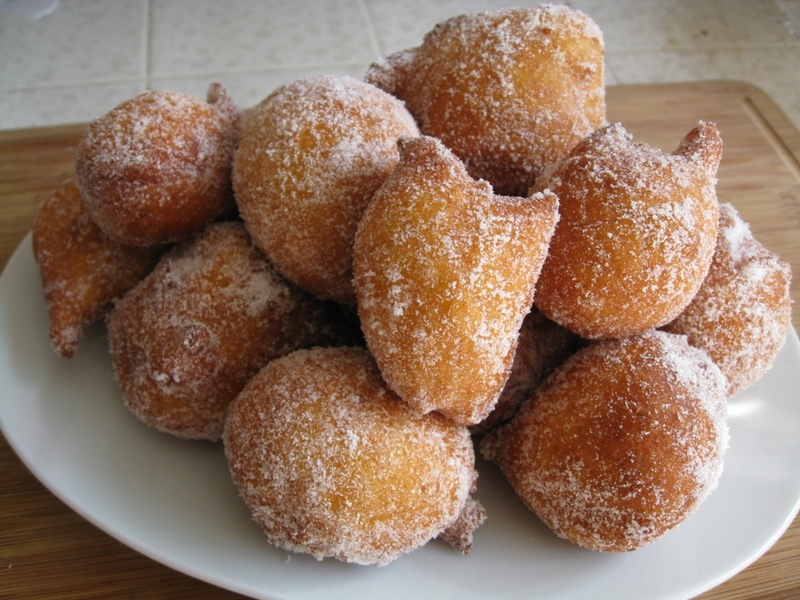 Yeast-raised and fried, malasada dough contains egg, usually one egg to every cup of flour, and they’re also made with either evaporated milk or cream. Malasada came to Hawai’i with the Portuguese workers who were brought to work on the sugar plantations. 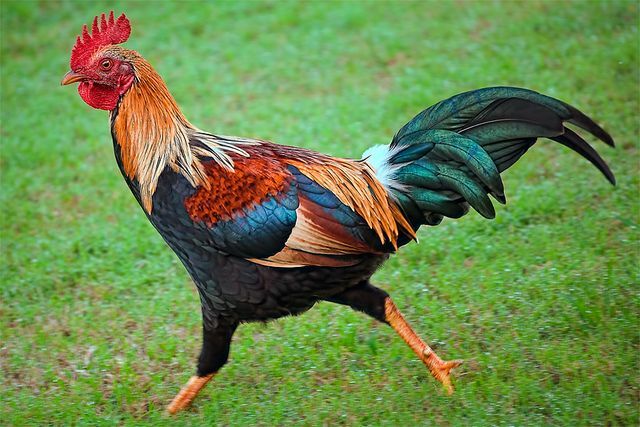 The Portuguese were mostly hired from Madeira and the Azores, considered highly desirable because they were skilled from working on sugar plantations there. Like other plantation workers they brought recipes from their home country with them, including malasada. The most famous place to buy malasada in Hawai’i is Leonard’s in Honolulu. Leonard’s claims to be the original malasada bakery in Hawai’i and they are well-worth a stop. While a traditional malasada is plain, they can also be filled with custard or coconut-flavored haupia, and Leonard’s carries a wide variety of filled malasada as well as plain. They make the doughnuts all day long so fresh ones are always available. 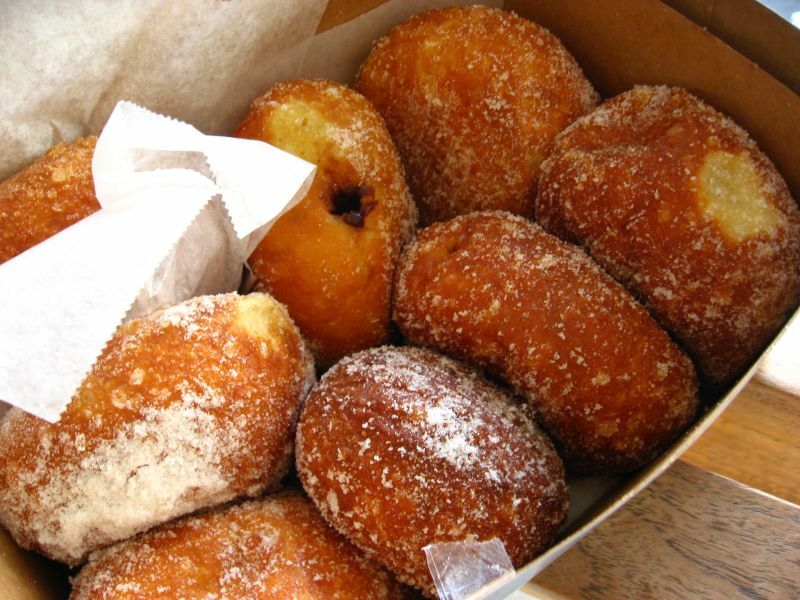 That’s a good thing – allowed to cool for too long, a malasada becomes dense and more like a fat bomb than a doughnut. Here on Kaua’i, malasada can be somewhat tricky to find. You have to know where to go and be willing to get up early to get them because they sell out quickly. Malasada are traditionally associated with Mardi Gras and the Lenten season, so a few more places around town recently had them available, although we abstained then. They are definitely worth searching out though if you are visiting, and nothing goes better with a hot cup of coffee! 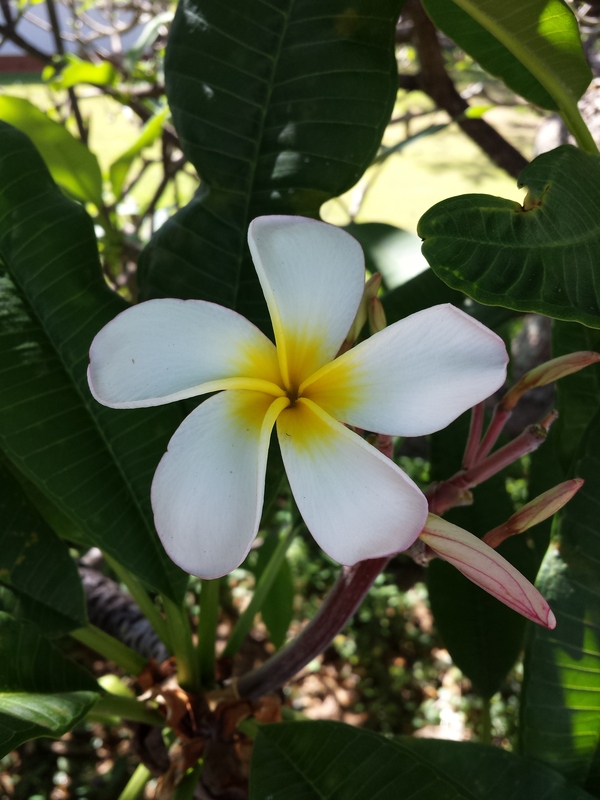 Although it does not snow on Kauai, there is a marked seasonal change that occurs sometime after Halloween, and may linger past St Patrick’s Day. 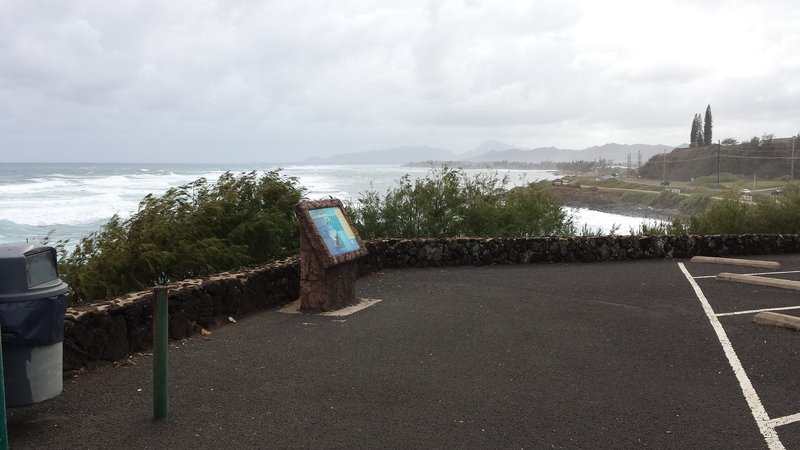 The grass is often greener, the surf a bit rough and choppy all day long, and the sky a deep gray as it appears a little closer to the beach before it engulfs the mountains. We frequently carry sweatshirts or sweaters when we go out in late afternoon because the trade winds gust up as the sun goes down. 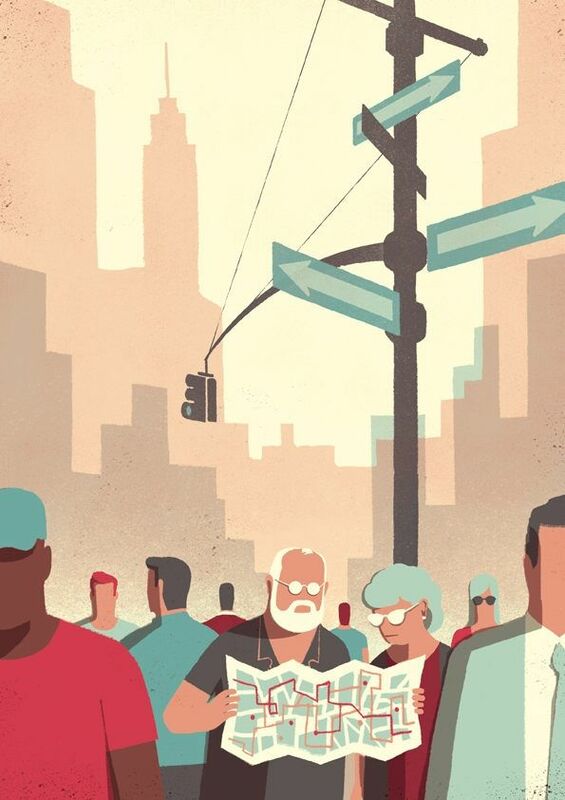 Really, it takes no time at all to acclimate to the warmer summer weather, and begin shivering as the mercury dips below 70 degrees Farenheit (21 degrees Celsius) on wintry evenings and early mornings. Throughout the non-hurricane season, we make fewer trips to the beach, and umbrellas are more frequently seen at cocktail bars. And, occasionally it rains like it’s never going to let up. Great masses of saturated soil slump and creep, and big things fall down the mountains with a rumble or roar. On the other hand, this is the best time of year for watching migratory marine life from the shore. A few weeks into this season, flash flood watches and warnings are issued by the National Weather Service for days on end. Roads are temporarily flooded and closed, and tragedy strikes more often in rivers and streams due to the heavily silted and rapidly rising water. Winter is different here, but it’s still paradise, still home. I adored summer when I was a child. Long sunny days with no school were spent at our beach house, or swimming in the neighbor’s or the community pool; playing ditch’ em, softball or other games with the neighborhood kids; or riding bikes to the park or to the library to get more books. I don’t think I ever wore shoes during the summer, or even flip-flops. I never gave a thought to the temperature, and southern California summers were hot. I sure don’t enjoy summer that much any more. Why? 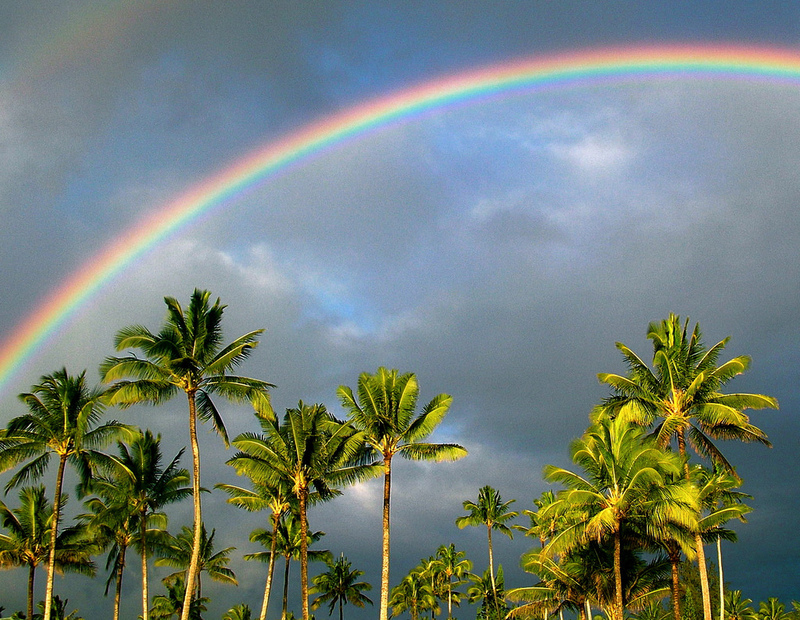 Because it’s hot, and here in Hawai’i it also can get very humid. My body doesn’t enjoy the heat like it did when I was child, and it definitely dislikes the increased humidity. I get cross more easily when I’m hot and I feel sluggish a great deal of the time. I’m also the one responsible these days for chores and such that I’m sure my parents and other adults probably hated having to do in the summer heat. 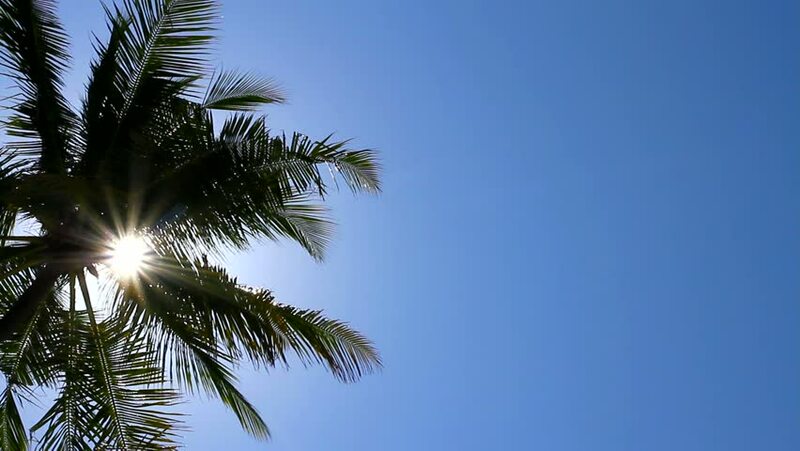 Most houses in Hawai’i don’t have air-conditioning. 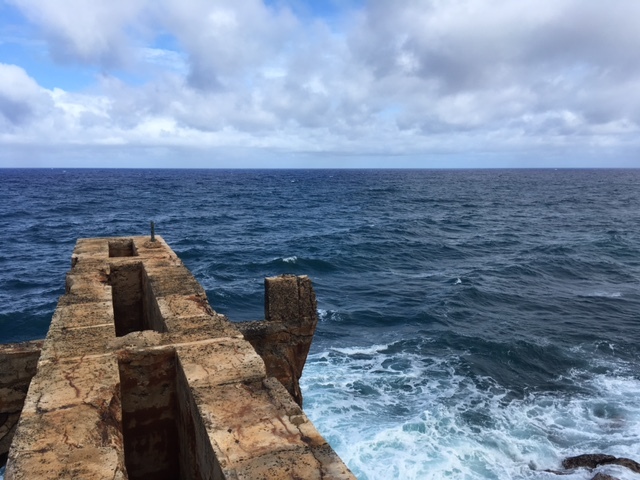 It’s expensive to operate here due to high utility costs, but the islands are also blessed with trade winds that blow nearly year round, usually keeping the temperature reasonable. However, as the earth heats up, that’s changing too. 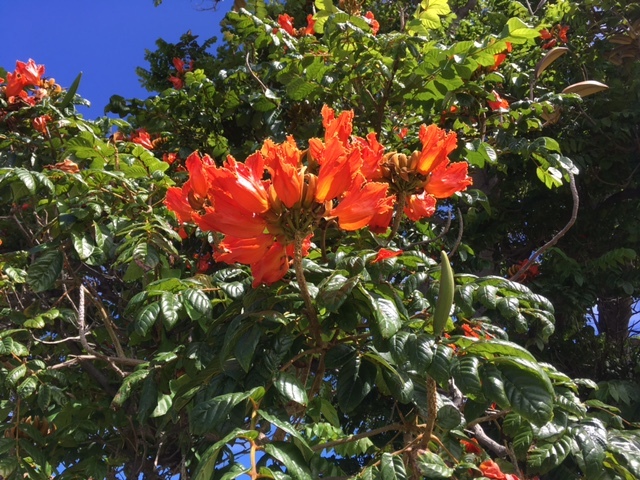 We’ve gone through two summers now where the trade winds have come to a halt for more than a month in late summer, and temperatures have sometimes climbed above 90°. Long-time residents also say that the trades are not as strong and cooling as they were in the past. We’re keeping our fingers crossed though that the past two years have been an anomaly rather than a trend. Running the ceiling fans: Unlike the house we started out in, our current house has plenty of BIG ceiling fans placed strategically throughout the house, including one in the kitchen. The bedroom fans do a fabulous job of keeping the bedrooms cool at night, and the big fan in the bathroom makes short work of the steam and humidity that build during a shower. Opening windows: Although we shut the windows at the front of the house at night, Brett gets up early in the morning and opens them and the front door, which allow the morning trades to flow through the house, keeping things nice and cool until early evening, when the trades seem to die off for a while, and the western sun beats down. Our house is situated though to avoid most of the late afternoon sun, unlike our old house with its big windows on the west side which caught the afternoon sun and heated up the entire house, especially the dining room and kitchen (it didn’t help either that our house was on the second floor, with the heat from below rising up and hanging around). Turning on the stove as little as possible: How I cook is definitely different these days than it was back on the mainland. Mainly, I try to avoid turning on either the oven or the stove if at all possible. If I do have to turn on the oven, I try for early in the day, and I leave the ceiling fan on. I avoid recipes these days that require long cooking times on the stove top, and let the girls handle stir-fries and such because they can tolerate the heat better than I can. We grill and use the slow cooker and rice cooker a lot as well to keep the kitchen area cooler. Saving chores until night: I do many of my cleaning chores after everyone else has gone to bed, like the dishes, the bathrooms, the floors and such. During the day just lightly pushing a broom around can cause me to sweat heavily. However, at night the temperature and humidity usually have dropped to more comfortable levels. Some things though, like the laundry, still have to be done during the heat of the day – ugh. Dressing appropriately: One of the things I love about living on Kaua’i is that no one here cares what you wear. So, I dress in my baggy linen pants every day with a loose, sleeveless linen or cotton top or t-shirt. It’s not the most flattering look for me, but it’s very comfortable in the heat. I don’t think I’ve ever worn a pair of close-toed shoes here. I’m not sure if Brett even own a pair of long pants any more ;-). Staying hydrated: I drink from the moment I get up in the morning until I go to bed at night. I start with a cup of coffee and move on to a couple of glasses of iced tea, and then water and non-caffeinated drinks after 1:00 in the afternoon (so I can sleep at night). We stop for shave ice more frequently during the summer, and Brett and I enjoy refreshing gin & tonics and mojitos for our weekend drinks rather than sticking to wine. Getting outside: One of the reasons we grew to dislike our old house was that we had no outside space to use when it got hot. Due to the stream running behind the house, and other drainage issues, the lawn was filled with mosquitos and other bugs, and our icky downstairs neighbors claimed all the patio area as theirs. We now have a lovely, large, private covered lanai in front that we can enjoy, especially in the morning and evening. We also live closer, and get ourselves to the beach more frequently than we did at the old house. Brett and I both swore we were never going to live in a humid area again after finishing a two year tour in southern Maryland followed by two years in Key West, Florida – and we had A/C in both places! Of course, we left Key West to go back to Japan, where the humidity in the U.S. is mere child’s play compared to what they experience there every summer. Our last Japan tour helped us decide where we would settle after Brett retired: Portland got wet, but it didn’t get humid. 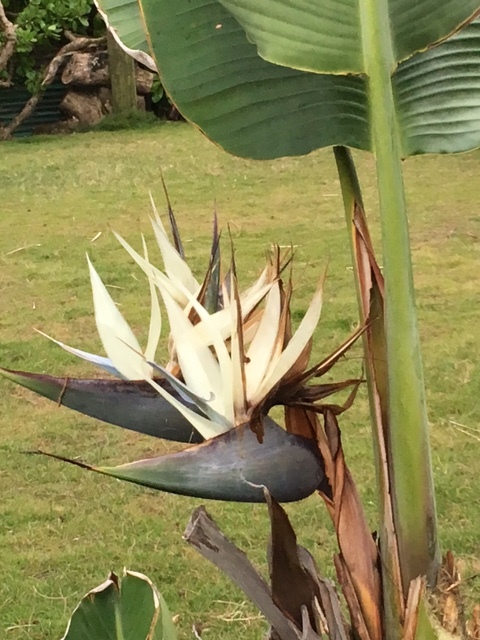 And yet, here we are on Kaua’i, where it’s humid year round, and we’re loving it. 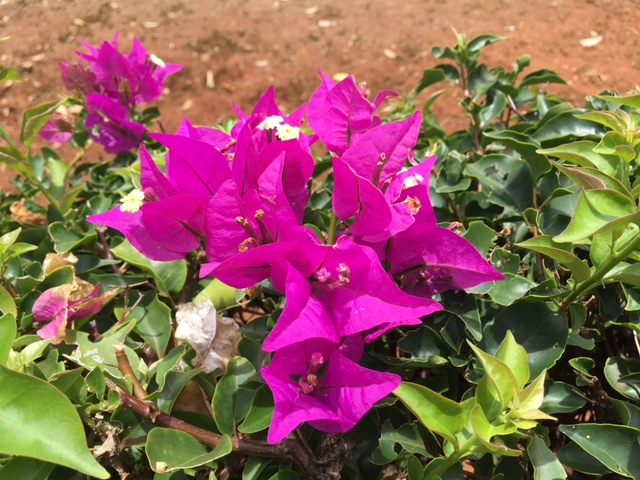 We found that when we were in Oahu last month that we didn’t enjoy the air-conditioning as much as we thought we would – we spent a lot of time out on the lanai, or heading somewhere else outside. 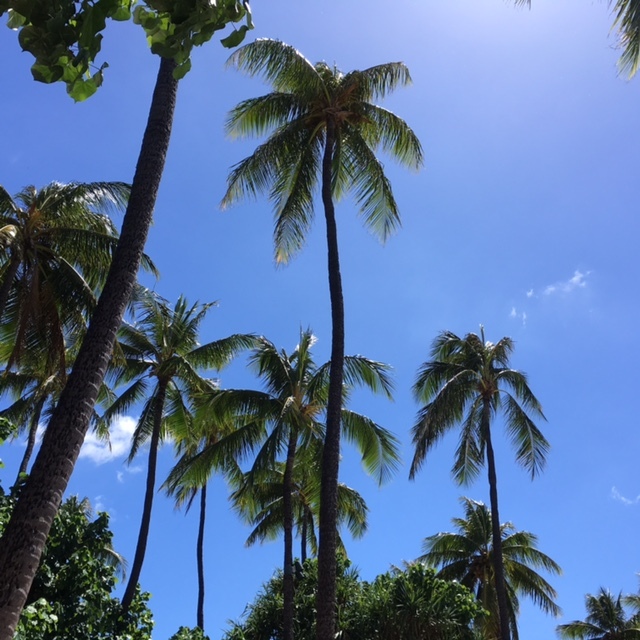 We know the summer’s heat and humidity here are only temporary, and that in early fall cooler temperatures and stronger trade winds will return (thank goodness), bringing back Hawaii’s beautiful, temperate weather. But for now, times are hot. 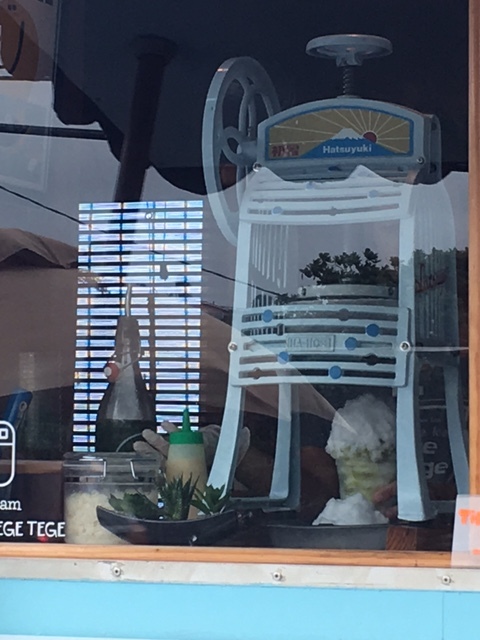 Tege Tege is the new kid in town when it comes to shave ice, or at least the new kid in the town of Kapa’a, on the east side of the island. Apparently Tege Tege has been operating up in Kilauea on the north shore for a couple of years, but a couple of months ago their truck showed up on the north end of Kapa’a, right next to Otsuka’s furniture store. We’ve never seen them without a line at their window. While I was getting my hair cut yesterday, Brett took the girls to give Tege Tege a try. 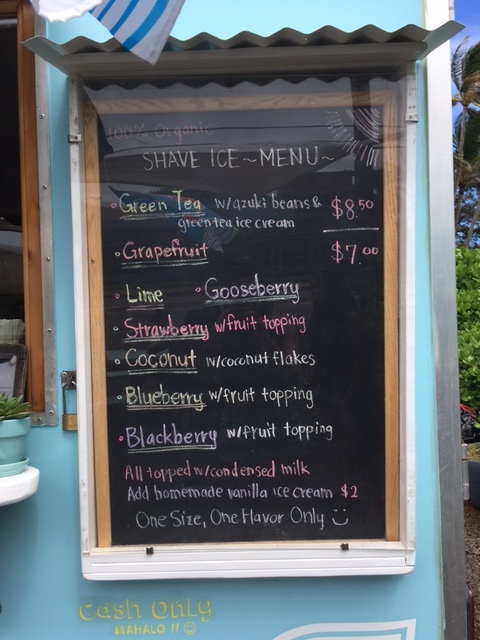 Brett selected a coconut shave ice, YaYu chose strawberry, and WenYu picked green tea. They also picked up an extra green tea shave ice for me (without the snow cap). Tege Tege’s ice is hand shaved using a special Japanese machine which creates extremely fluffy ice with an almost creamy texture. Organic fruit syrups are added several times along the way as the cup is filled with ice, ensuring each bite is full of exquisite flavor. 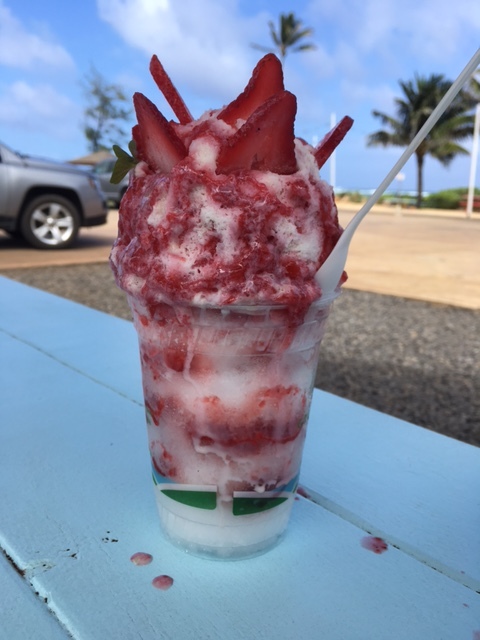 Each shave ice receives a complementary snow cap, and with the exception of three flavors (grapefruit, lime and gooseberry) each icy confection is topped off with fresh, organic fruit. 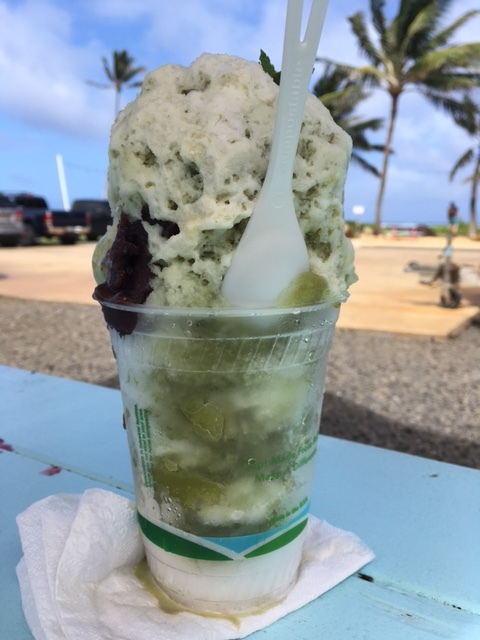 Instead of fruit, a green tea shave ice receives a generous helping of anko, sweet red (azuki) beans, the traditional accompaniment to green tea flavor in Japan. All this quality and craftsmanship comes at a price though. Regular flavors are $7 each; green tea is $8.50. Ice cream is an additional $2.00 (we skipped the ice cream). 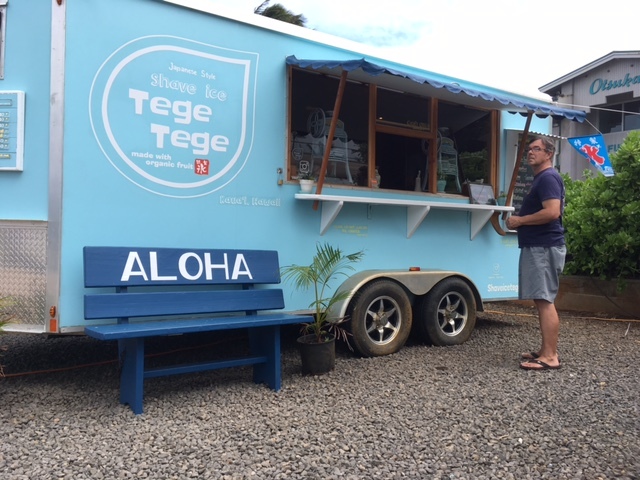 Tege Tege only offers eight flavors, but finished product is big, and the shave ice is dessert quality and very filling. The Tege Tege trailer is within walking distance of our house, so I’m sure we’ll be going back one of these days. The cost is pretty high for shave ice, but the quality is several steps above what we’ve had elsewhere. The presentation is beautiful, the flavors unbelievably rich, and the texture amazingly creamy. In our opinion, Tege Tege is well worth a splurge once in a while! Our short visit to Waikiki has been . . . perfect. In just two and half days here we’ve enjoyed great weather, gotten everything done we wanted and needed to do, and we‘ve relaxed. 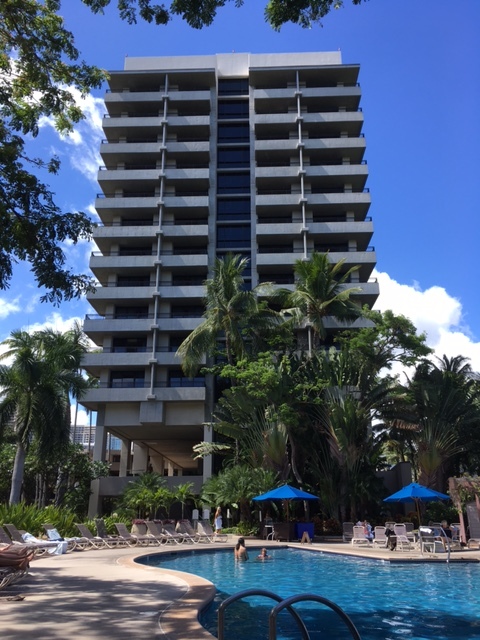 Our hotel tower, one of two at the Hale Koa. Our room was on the top floor, second from the left. The Maile Pool (18 and older only) is in the foreground; there’s another larger pool on the grounds for families and children. 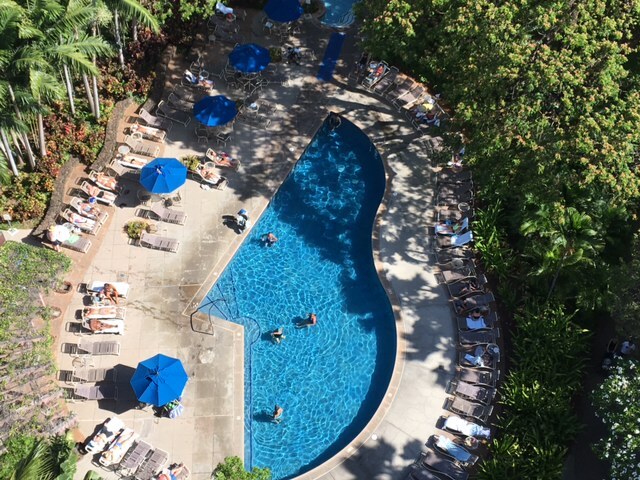 Looking down from our lanai at the Maile pool. 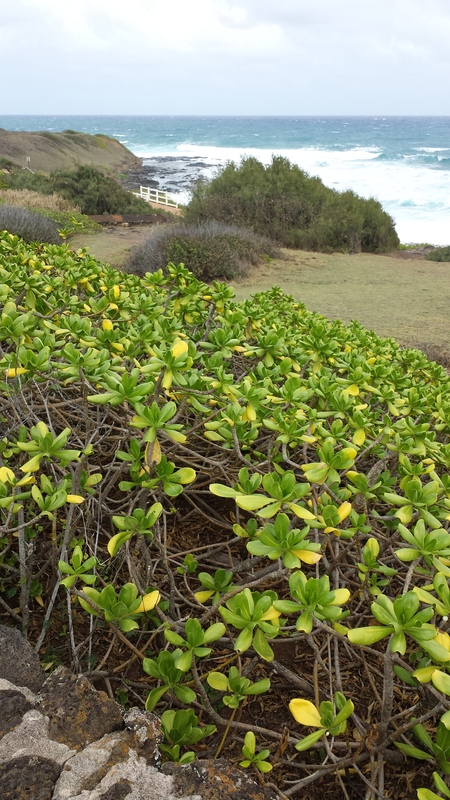 Beautiful landscaping surrounds the Hale Koa. 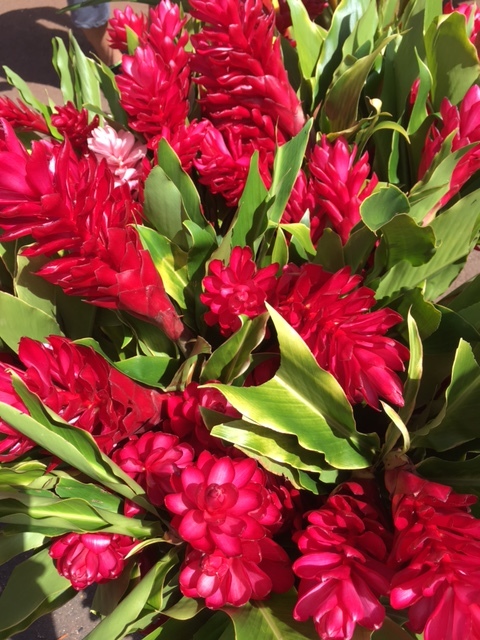 One of our primary reasons for coming to Oahu was for the girls to do some shopping. Neither has really bought any new clothes for two years other than t-shirts for school, and with WenYu needing clothes for college they were eager to hit the stores. After we checked in on Wednesday afternoon we took a short walk over to the Royal Hawaiian Shopping Center to let them get started. Brett and I turned them loose while we found a quiet seat outside and enjoyed coffee and lemonade, and watched Japanese tourists shop and learn the hula (they picked it up very quickly). 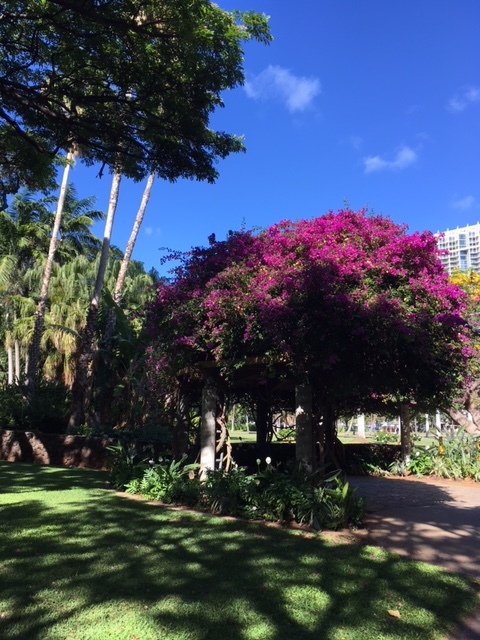 We slept in on Thursday morning, enjoyed our breakfast on the lanai, and then walked over to the huge Ala Moana Center, about a mile away. The girls took off on their own once we got there, and Brett and I mostly spent our time window shopping but bought a couple of things for ourselves: I got new pair of slippahs (flip flops) and some lingerie, and Brett got a new 10-year shaving brush for his Father’s Day gift – his old one is on its very last legs. We met up with the girls in the late afternoon and rode the bus back to the hotel. Dinner that night was at one of the hotel snack bars, with the girls staying to swim for awhile afterwards and Brett and I heading back to our room to enjoy the sunset. 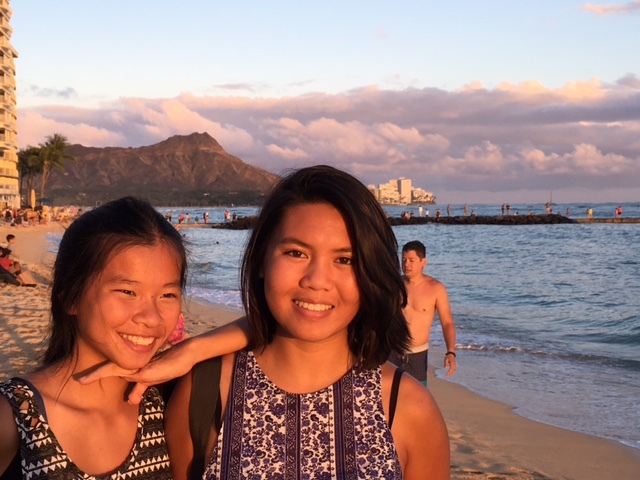 We surprised the girls when they got back with some tasty cupcakes from the famous Magnolia Bakery – they have an outpost in the Ala Moana Center. 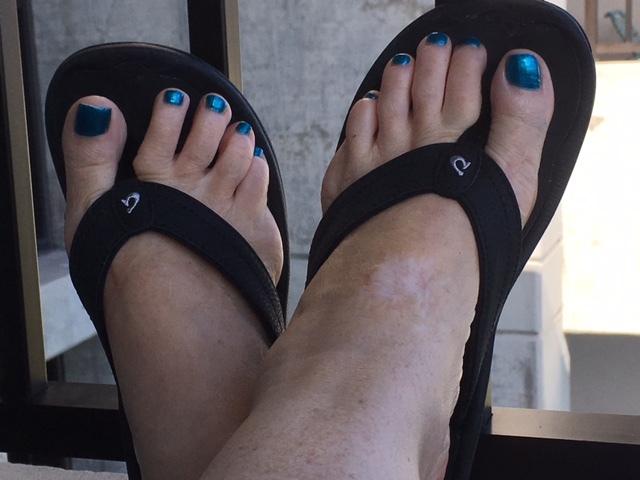 New slippahs and a pedicure! Yesterday was dedicated to relaxation. We slept in again, had breakfast on the lanai, and then we all headed in different directions for a while. Brett visited the nearby Army Museum of Hawai’i, the girls went to the pool, and I went to the day spa for a manicure and pedicure. We all got together for lunch at another one of the snack bars (all the snack bars served really tasty food), then headed to the pool for an afternoon of swimming and sunbathing. The girls took off early and went back into town for one last round of shopping while Brett and I relaxed at the Maile pool for a while longer. We had not planned to do any restaurant dining, but one of the Hale Koa’s restaurants hosts an all-you-can-eat buffet every evening at a very reasonable price, and Friday evening we learned they were serving crab legs and peel-and-eat shrimp as well as the regular menu items, so we decided we had to go. Our table came with a gorgeous view of the beach, and the food was amazing! We all ate too much, but agreed it was well worth it! 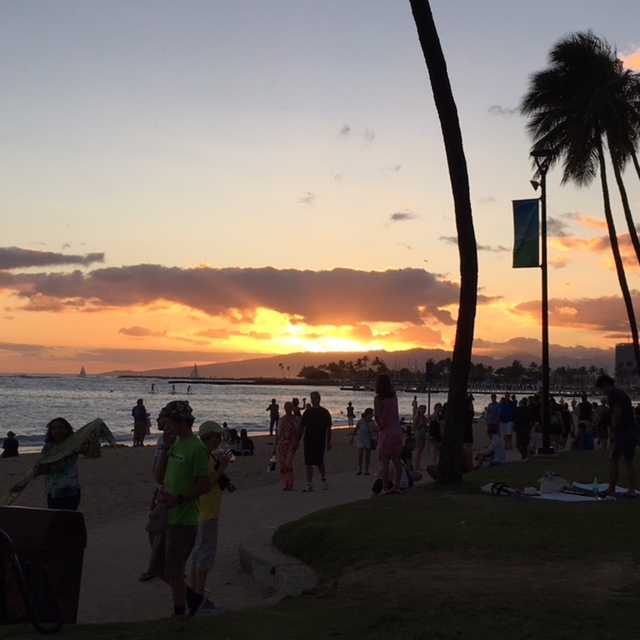 Then we headed down to the beach to view Diamond Head once more, and see the sun set, before heading back to our room to watch the fireworks show in honor of Kamahemeha Day, the biggest state holiday in Hawai’i. We ended the day getting everything packed and ready for this morning’s departure for home. 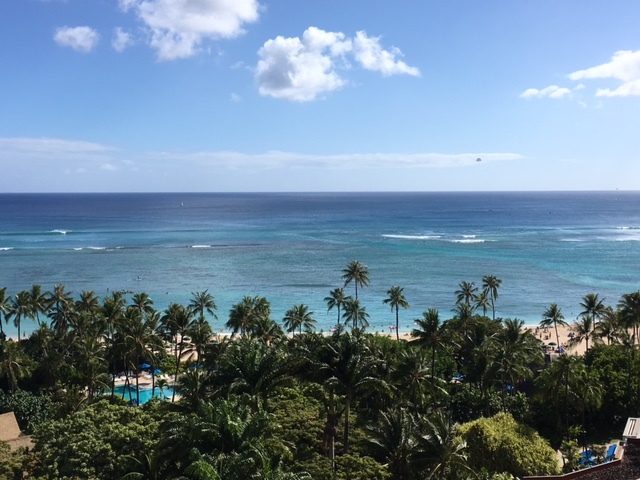 While we greatly enjoyed the hustle and bustle of Honolulu and Waikiki, we are glad to be heading home to our slower-paced island. The getaway was a great one though – we all had a terrific time, got what we needed and did not go over budget! Brett and I are especially proud of the girls and their shopping prowess – they found lots of great stuff and are coming home with money still in their accounts. We’ll definitely be heading back to Waikiki again, but next time will give ourselves more time for sightseeing around the island. 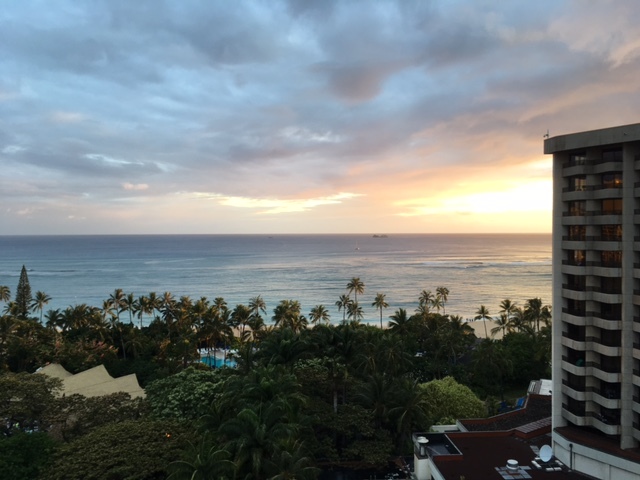 We loved our time on Oahu!